Pour St. Joseph Abbey's Spencer Trappist Ale into this handsome glass, which was designed, through the collaborative efforts of the monks, Libbey Glass, and other expert consultants, to be the perfect vehicle for enjoying Spencer Trappist Ale. 4-color Spencer logo on one side of glass, 4-color bell logo and fill line on other side. Inside of bowl has an etched nucleation point in the shape of the Spencer bell. Approximately 7-1/4" H x 3-1/2" diameter (at widest point); 0.33 liter/11.2 oz capacity. Apr 23, 2018 | By Harry Z. Glass arrived in perfect condition, is attractive, and completed my collection of glasses representing the Trappist Monasteries. Thanks. Jun 15, 2017 | By Gene C.
You MUST have this awesome "chalice". 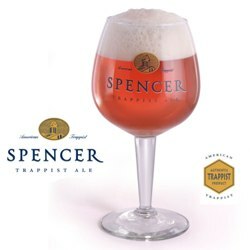 Specially designed for Spencer Trappist Ale, the stem inside the bowl is etched with their signature bell. This serves as the focal point for oxidation, causing the bubbles to emanate and rise from a single concentrated spot. Like smoke rising, the foam spreads evenly across the top of your beer beautifully. Poured correctly straight into the dampened chalice, from ten inches up, the collar will not spill from the top. Plus, these are just handsome glasses. I ordered a specialty glass for my son-in-law's growing collection. It arrived very quickly and was packed well. He was very pleased to receive it for Christmas.